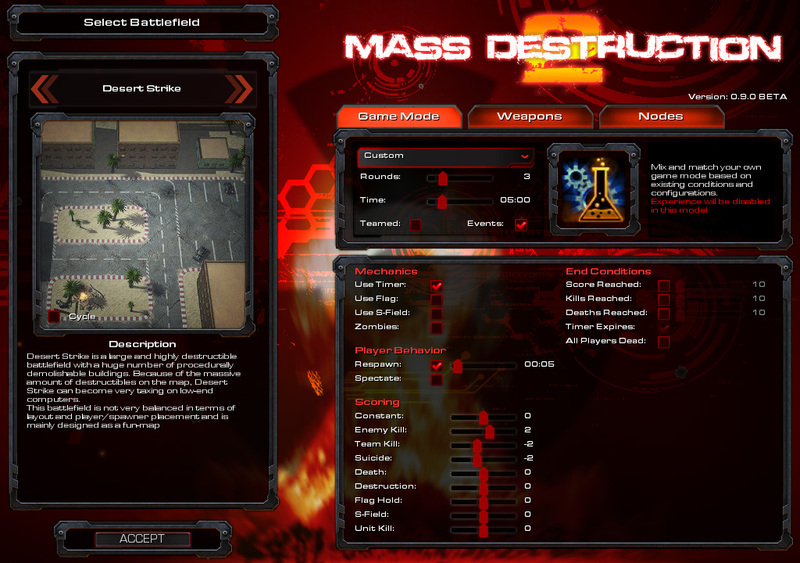 Mass Destruction 2 is a arcade styled multi- and single-player map being made for Starcraft 2. 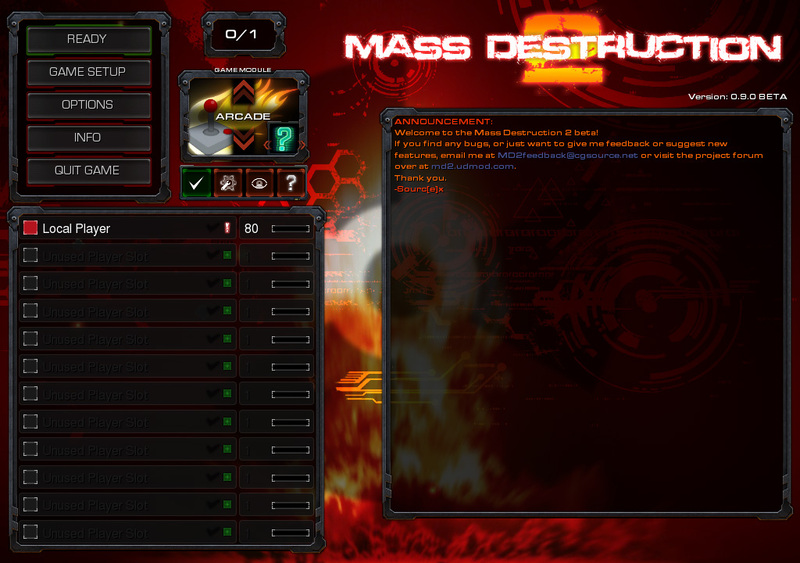 Mass Destruction 2 is currently under development. For discussion and development information, visit the project forum over at UDMod. 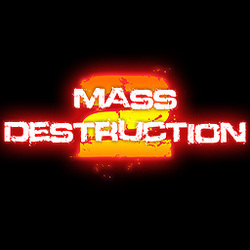 Mass Destruction 2 (MD2) is a third person tank shooter developed for Starcraft 2. The game is highly configurable and features a wide range of game styles (modules), game modes, weapons and power-ups to create a diverse and enjoyable gameplay with a healthy dose of replayability. These are just the default controls of the tank, and can be changed at any time by the player. Move the mouse cursor around the screen to aim your weapon. Game modules defines the type of game the players are playing. Each module comes with a unique set of game rules. 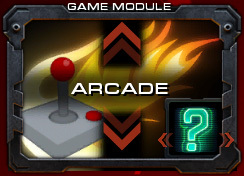 Arcade is the standard mode-based player versus player module and comes with a variety of Game Modes. Arcade can be played with teams if chosen by the Game Administrator. Classic deathmatch mode. Kill as many player as you can before the timer expires. Cause as much destruction as you can before the timer expires. Collect and hold on to the flag for as long as you can, but stay inside the designated area or you'll get punished. The current location of the flag is marked on the radar with a white dot. Destroy the enemy tanks, but more importantly; stay alive. No re-spawns here. Last man/team standing wins. Stand inside the marked area to gain points while keeping the enemy players away. A random one of the game modes above will be chosen every round. The default modes not enough for you? Mix and match your own game mode based on existing game mechanics. Experience points are disabled in custom modes, but general stats will still be tracked however. Battlefront is a team based tug of war game loosely inspired by the AoS map genre. The players are divided into two teams and must defend their base while trying to destroy the enemy team's base. Players must make use of their team's armory to upgrade both their tank and attack forces. Apocalypse is a wave based cooperative survival mode where the goal of the players is to survive for as long as possible. The Juggernaut is a massive tank with heavy armor and unmatched firepower. The player with the lowest score will be picked to play as the Juggernaut. If the Juggernaut is destroyed, the player that destroyed it will become the new Juggernaut. Points are earned for killing as the Juggernaut, or dealing damage to the Juggernaut. The player with the most points at the end of the round wins. Unlimited ammunition and armor and faster weapon reload times, this is a place to screw around and get familiar with the various weapons found in the game. The only way to end this module is by a end game vote. The game variant is a property set by the game host before creating a custom game that determines what modules will be available once ingame. Immediately launches a quick FFA Arcade game using default settings. In-game lobby will be skipped and the game will quit back to SC2 once the game session is over. Immediately launches a quick team Arcade game using default settings. 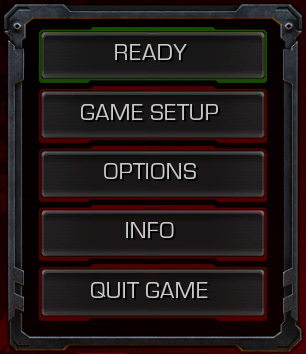 In-game lobby will be skipped and the game will quit back to SC2 once the game session is over. The Team Manager will show up before the first round starts. All module and game mode settings can be changed in-game. Game is locked to the Arcade module. Game is locked to the Battlefront module. Game is locked to the Apocalypse module. Game is locked to the Juggernaut module. Plays like the Unlocked variant, but allows for debug command inputs. Saving will be disabled. The game lobby is where the Game Administrator sets up the game and players adjusts their settings. All players are returned here between each game. All players must click this button in order for the game to start. To the right of this button is a counter showing the number of ready players over the number of active players in the game. In case one or more of the players goes AFK during the lobby, any player can click the force ready button in the Quick Menu to start the game. This button is only available to the Game Administrator and only on customizeable game modules like Arcade and Juggernaut. This is where the rules of the game can be tweaked. Contains all player-specific options. Here the player will be able to adjust key mapping, settings and customize their tank. This menu contains general game information such as weapon descriptions, changelogs and credits. Allows the player to quit the game with a "victory" status. This is where the Game Administrator can browse between the different game modules. When Arcade is selected, the game mode will also show up in the bottom right corner of this window. Hold the cursor above the module name/mode icon to display details around the current selection. Forces the game to start even though some players aren't ready. This button can be pressed by any player but will only be clickable after 90 seconds in the lobby. Allows the players to manage general settings and key mapping without having to go into the options submenu. Displays the battle log from the last played game. The battle log contains the main events of the game. Displays the help window which contains a lot of information to help newcomers get into the game. This is very much a WIP at the moment. Self-explainatory. It's a list of all the available players in the game. Hold the cursor above a player's name to see their stats. The lobby chatbox displays messages sent and received by players and announcements made by the map author as well as other notifications for the player. The Game Administrator is responsible for setting up the non-player specific options like the game module/mode, number of rounds, round duration and weapon/power-up configurations. MD2 will go through the active playerlist and give the Game Administrator status to the first available player, in most cases the game host. The Game Administrator is marked with a exclamation mark in the lobby player list. All weapons generates heat to the tank turret when fired. Too much heat causes turret overheating. When you're overheated, you will not be able to fire any weapons before the turret has been fully cooled. The item spawners are structures scattered around the battlefield continuously spawning new weapons and power-ups for players to use. Players can simply run over spawned items to pick them up. Game events only applies to Arcade games and are events triggered by the game at random times to screw with the players. A warning is displayed when a event is about to be unleashed. Watch out for black holes and nuclear missiles. Game events is a optional feature decided by the Game Administrator. The Team Manager is the system that manages the player teams. Its interface will show up right before a teamed game to allow the players to configure their team. MD2 comes with an advanced tank A.I. that makes it possible for players to play with or against computer players. The A.I. 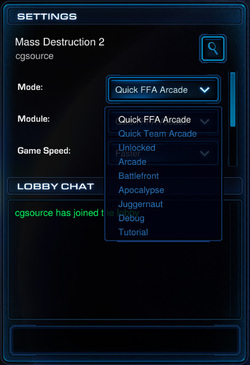 players can be added directly in the game lobby by the Game Administrator, or in the default SC2 lobby by adding normal computer players. The A.I. was primarily designed to be used in the Arcade and Juggernaut module, and will not function as good in other modules. MD2 supports spectator players which can just sit back and watch the game. 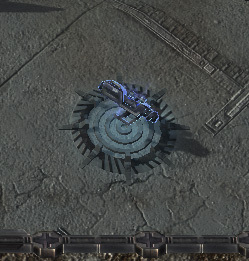 Players can only become spectators by selecting the player type in the SC2 lobby after joining a game. Displays what weapon you have currently equiped and how much ammunition is left for that weapon. Diaplays the player's current armor/health. When this reaches zero, you're dead. Displays the cooldowns for the weapon. The bottom one is turret heat level, the upper one is weapon reloading. Displays the currently equiped powerup and how long it'll last. Displays the game timer or the current amount of credits depending on which one is used by the current module. This option opens up a list of available vote polls. Vote polls are used to let players vote for a certain action to take place. Only available in Battlefront, this vote poll allows a team to surrender before the team's science facility has been destroyed to shorten down the game. Players can here vote for a new Game Administrator. Enables players to kick annoying or AFK players from the game. Opens up the quick settings dialog window which allows the player to manage general settings and key mapping on the fly. Opens up the help dialog window where the player can read more into the map information. The H.E.A.T. Round is the default weapon of MD2 and is a accurate line weapon with a punch. Dual rapid-fire Gatling Guns. A bit inaccurate, but very good at short range combat. The missile pods will fire two missiles in a straight line, dealing a lot of damage on impact. Strong short range weapon, the flamethrower will pass right through targets, allowing it to damage multiple players. The laser is a rapid fire weapon that will not only deal a lot of damage, but will also heat up the weapon of players it hits. The laser will pass right through targets, allowing it to damage multiple players. The seeker missiles are homing projectiles that will follow a target. You can either click on a player to lock on to their tank, or just target a point on the ground. The artillery is a slow but effective weapon designed to target tanks on different cliff levels. The artillery projectile will land approximately on the position of the mouse cursor at the time of firing. The land mines are powerful anti-armor explosives concealed on the ground that will detonate as tanks passes over them. Firing this weapon will deploy a land mine underneath your tank. Land mines will only be visible to the owner and will detonate on enemies and friends alike. The E.M.P. Burst projectile will power down all tanks and mechanical units within its detonation area for a short amount of time. Units hit by the E.M.P. will not be able to move, aim or shoot. The armageddon cannon is the most powerful weapon in the game. It packs a massive recoil and generates enough heat to overheat the turret with a single shot. Powerups are special temporary abilities gained by picking up powerup items spawned by item spawners. Powerups must be activated by the player manually after picking them up. Allows the player to jump up cliffs and evade incoming projectiles. Keep pressing the powerup key after activating it to jump more. Temporarily boosts the tank's movement speed. Temporarily boosts the tank's weapon damage. Temporarily boosts the tank's armor. Temporarily boosts the tank's attack speed. Makes the tank impervious to heat generated by firing weapons. Does not help against being attacked by a player with a flamethrower. Teleports the tank a short distance towards the current mouse cursor position. All projectiles fired at the tank will bounce off. Also makes the player unaffected by physic forces. Debug commands can be used in debug games. To activate a debug command, type it in the default chat and hit enter. -reset players: Resets all players and their weapons. -add ai: Adds a new A.I. player to an open player slot. -add ai all: Fills the remaining open player slots with A.I. players. -cr #: Adds # credits to the player. -cr all #: Adds # credits to all players. -end round: Ends the current round. -end game: Ends the current game. -give weapon #: Adds the weapon to the player. -give powerup #: Adds the powerup to the player. -give all: Gives 9999 ammunition to all weapons. -no heat: Removes weapon heat generation. -no heat all: Removes weapon heat generation from all players. -fast reload: 400% reload rate. -instant reload: 1000% reload rate. -instant reload all: 1000% reload rate for all players. -next event: Immediately starts the next random event. -stop event: Stops the current random event. -mob: Spawns 60 hostile marines at the cursors current position. -supermob: Spawns 300 hostile marauders at the cursors current position. -restore: Restores all battlefield destructibles back to normal. -shield: Adds and activates force shield powerup for all players. -godmode: Gives you 1000000% armor and 10000% damage. -gold: Turns your tank into gold. -jumpjet: Gives the player the jump jet powerup. -double speed: Gives the player the speed boost powerup. -space: Launches the player into orbit. -next event: Immediatly starts the next random game event. -gravity #: Sets the game gravity force. Default value: -0.03. -set armor #: Sets the current armor of the player's tank. -set damage #: Sets the current damage of the player's tank. -set weight #: Sets the current weight of the player's tank. -set speed #: Sets the current movement speed of the player's tank. -doomsday: Gives the armageddon cannon to all players. -jump to: Moves the player to the current position of the mouse cursor. -float: Toggles tank floating mode (Comanche mechanics). -trails: Toggles spawning of tank dirt trails. -knockback: Runs a test of the unit knockback engine at the current location of the cursor. -juggernaut: Turns the player into the Juggernaut Tank. -pause: Pauses/unpauses the player's movement thread. -pause all: Pauses/unpauses all the players movement threads. -reject: Toggles the force shield effect to bounce projectiles off the tank. -time #: Sets the duration of the game timer. -scale #: Rescales the tank model. A value of 1 is 100%. -show ui: Toggles the gameplay UI. -battlefield #: Changes the battlefield to the given id. -ai stop: Stops the A.I. thread. -ai start: Restarts the A.I. thread. -debug game: Opens up a dialog with game debugging information. -debug player: Opens up a dialog with player debugging information. -debug ai: Opens up a dialog with A.I. debugging information. -debug hide: Hides all debugging dialogs.